Ballers and Bankruptcy - Why Do Star Athletes Keep Going Bust? It’s understandable when mere mortals have a financial hiccup and end up in bankruptcy, but it’s a little harder to fathom how a mega-star athlete earning millions per year can go bust. But it happens again and again leaving many scratching their heads wondering what went wrong and why it seems to make headlines so often. 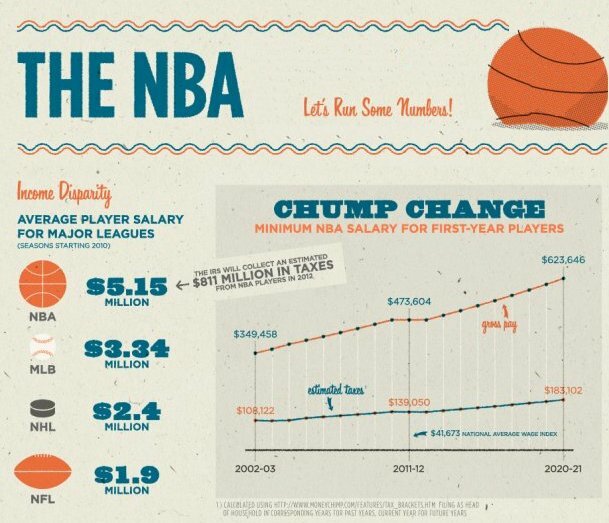 From the NFL to NBA and MLB – stars in all of the major sports are struggling financially. Let’s find out what they have in common. NFL Players. USA Today reports that 78% of NFL players go broke within a few years of their career ending. What? Yep. With an average salary of $2 million and a career lasting typically just seven years, it’s still a lot of money but not as much as you might think. Taxes strip out roughly 40% and the requisite sports agent another 3-5% of the athlete's take. So for those netting just $14 million, it’s really more like $1 million a year take home. That’s not too shabby and, for those earning the really big bucks, it’s harder to comprehend an empty bank account. The Giants’ Lawrence Taylor raked in a cool $50 mill between 1981-1993 but partied most of it away and filed bankruptcy just a few years after retiring from the gridiron. Bad investments, drugs, criminal troubles, child support doled out to lots of ladies and lavish spending are common denominators in NFL bankruptcies. NBA Hoopsters. The NBA fares little better with bankruptcy statistics – 60% of basketballers are broke within five years of walking off the boards. Of all the pro sports leagues, NBA players have the highest average salaries – most players earn $5.15 million and superstars walk away with 10 times that. They play more games and have smaller rosters than football teams, so the higher salaries make sense in terms of work for hours played. Allen Iverson earned over $154 million playing for the 76ers and, briefly, a few other teams. Yet last year, his Georgia mansion was seized. How did this happen? A huge entourage, a personal hair stylist to travel with him, legal problems, bad investments and out of control spending drained away his fortune. His bankruptcy filing served as a “what not to do” when it comes to managing a fortune earned from your sweat on the court. MLB Sluggers. Pro baseball players earn an average $3.3 million per year but play the most games to earn that change – around 160 per season – that’s a lot of hard work. 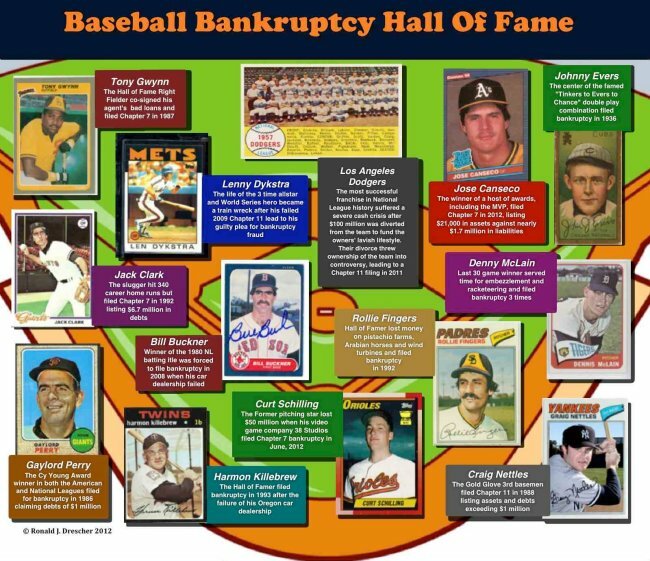 While the percentage of MLB players going broke is not as shocking as the other major leagues, the sport still has its share of financial ne’er do wells – the most infamous of which is Lenny Dykstra. Mets and Phillies wild man Dykstra was worth $58 million in 2008, but late last year was sentenced to jail time for defrauding the bankruptcy court. After going broke and filing for bankruptcy relief, he hid assets including expensive appliances, sports memorabilia, including jerseys, uniform pieces and other items. He was convicted of diverting more than $400,000 of assets that should have gone to his creditors. Dykstra has also had other criminal issues that have plagued him since he left the league. Why Are Athletes So Prone to Financial Problems? One of the main issues seems to be lack of financial education coupled with loads of money piled on them while they are young and inexperienced. Poor financial advice is also an issue as many lose their fortunes to poor investments and bad business decisions that lead them to financial ruin. Still others that come from impoverished backgrounds often begin supporting their families and that drains their bank accounts. Lots of players are lured into fast and lavish lifestyles of big houses, fast cars, women, drugs and worse. If you are dealing with overwhelming debt, you don’t need to be a big time athlete to get good advice on your bankruptcy options. Contact us now to discuss whether a Chapter 7 or Chapter 13 bankruptcy – or other financial option – may be your best choice to get your finances, and your life, back on track.